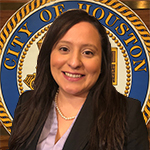 June 29, 2018 -- Mayor Sylvester Turner has selected Maria Montes to serve as director of city of Houston Boards and Commissions. The department works with Houstonians appointed by Mayor Turner who volunteer their time for the benefit of the community by constructing policy, fundraising, aiding fellow citizens and planning for Houston’s future. The director of Boards and Commissions oversees the process of receiving nominations for individuals to serve on boards and enhances the panels’ collaboration with city departments. Montes will join Mayor Turner's office on Monday, July 2nd. Before joining the mayor’s team, Montes worked with Transwestern as an administrative associate and property manager. Through her position, she oversaw meetings, special events and lease administration, along with fostering positive relationships between management teams, tenants and owners of the property. Montes has also worked in administration with the Ayrshire Corporation and former State Senator Rodney Ellis, now a Harris County commissioner. From 2008 to 2011, Montes served as director of operations with Cherish Our Children International, a non-profit organization dedicated to improving the lives of vulnerable children. Prior to non-profit work, Montes was the director of client relations at Strong Strategies LLC, where she managed campaign reports to the Texas Ethics Commission. In 2014, Montes received the Rising Star recognition from the Houston League of Women Voters for demonstrated leadership and positive contributions to the Houston community. Montes graduated from Hollins University with a Bachelor of Arts in communication studies and recently received her Master of Business Administration from the University of Houston-Downtown.